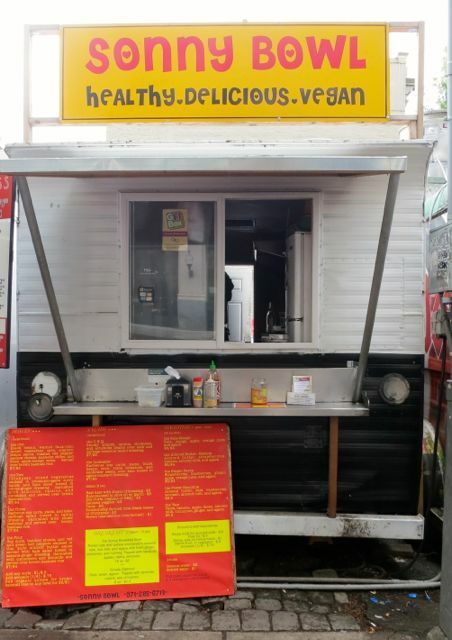 Portland is known to be one of the food truck meccas of the US. Combine that with its status as one of the most vegan-friendly cities in the US and you have yourself a city filled with vegan food trucks. 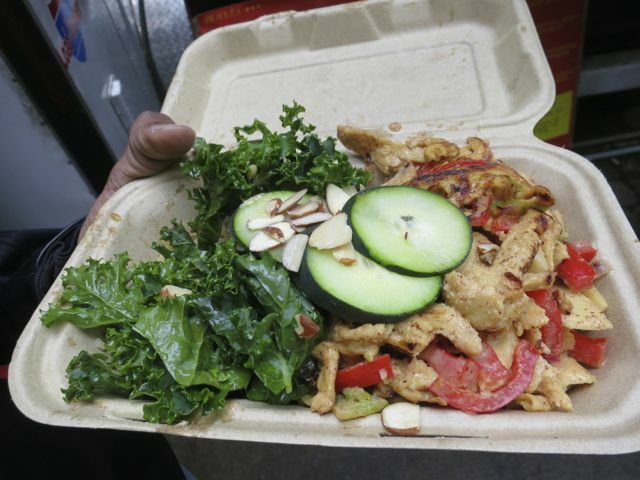 In most cities, you are lucky to find a vegan option in a food truck. 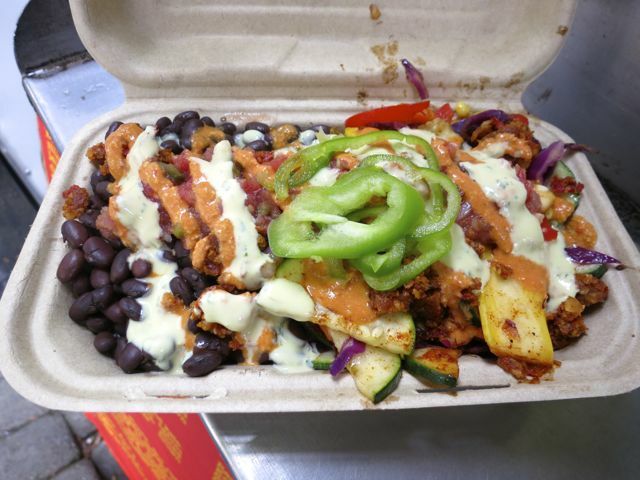 Here, you find 100% vegan food trucks. Love it! I started my trip off by going to Sonny Bowl for lunch. 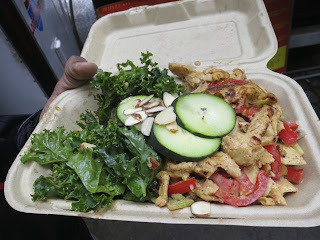 Sonny Bowl is located on a street lined with food trucks and there are at least two all-vegan food trucks just on that block. I chose Sonny Bowl for my meal because I really wanted a fresh, wholesome meal. They have a basic menu of bowls, salads, and smoothies. I ordered a large Number One and a smoothie. 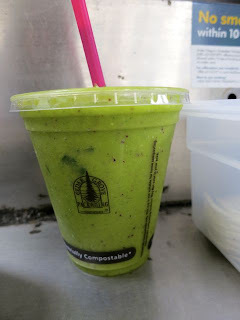 The Kale-Mango smoothie was a delicious blend of orange juice, apple, kale, mango, and agave. I could have drank 4 of them. When I picked up my lunch, I was floored at the sheer weight of the container. It was filled to the brim! The bottom layer was mostly black beans and brown basmati rice. On top, there were mixed vegetables, corn, anaheim chilis, and walnut faux-rizo served with cilantro-lemon sauce, roasted red pepper cashew cheese, and fresh apple-mango salsa. It sounded so amazing, but the taste left me disappointed. It was a nice vegetable, bean, and rice bowl, but, unfortunately, it wasn't nearly as good as it sounded. That said, it was good, but with all of the vegan options in this city, I was left wishing I had chosen another cart. Willing to give it just one more try, I tried my friend's The Four. This was soy curls, bamboo shoots, and red and green bell peppers sauteed in Thai style almond butter sauce served with kale salad tossed in sesame-ginger dressing over rice. On top, there was fresh cucumbers and almonds. Again, the same impression -- good, but not great. Both bowls cost $7 so they were quite the value given the amount of food served. However, as I previously mentioned, with so many incredible options in Portland, I have to say that I am going to choose to dine somewhere else the next time I am in town for a limited period of time. I love that they are serving fresh, wholesome vegan food, but the flavor is lacking in the sauces. SW 3rd Avenue & SW Washington St. I think I'm going to have to go to PDX again, because I missed this little corner of vegan food trucks.